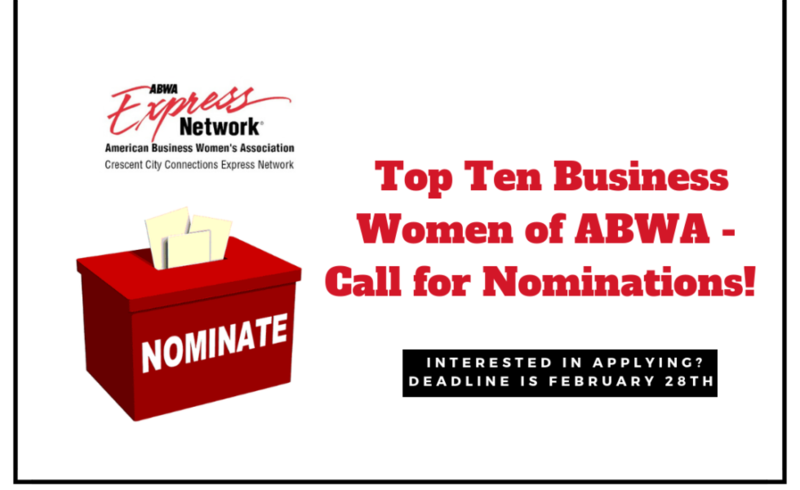 Top Ten Business Women of ABWA – Call for Nominations! CCCEN would like to hear from you! We are seeking a representative as our league’s Top Ten National Woman of the Year nominee. Since its inception in 1953, ABWA has recognized hundreds of women for the coveted award, the Top Ten Business Women of ABWA. This award is intended to underscore a member’s professional accomplishments (career advancement and academic achievement), contributions to her community and engagement in ABWA. This is an incredible national honor, as we were thrilled that our very own Amy Landry was chosen as one of last year’s Forever Top Ten Women of the Year recipients! Once the CCCEN board approves the candidate, she will be assigned a seasoned mentor to help with the application process. Completed and signed applications are due to National by May 15. From there, National will select 10 honorees to be recognized at the October National Women’s Leadership Conference, October 2-5 in Kansas City, Missouri, where the Top Ten Honoree will be chosen. If you are interested in applying, please contact Carol Newman no later than February 28th at canewman@bellsouth.net. Be a female and currently employed (part or full-time). Have been a member in good standing for at least two consecutive years as of May 15, 2019. Have a primary affiliation with the sponsoring league for at least one year as of May 15, 2019. Have served on the National Board of Directors and/or on the national/regional conference team and/or served as an officer, committee chair, league advisor for her primary league since 2016. Have sponsored at least three members since 2016. Have earned at least one Apex Certificate since January 1, 2018 by completing one on-line course in the Apex Campus. Have attended at least one nationally sponsored ABWA event (Regional Conference and/or the National Women’s Leadership Conference) since 2016.